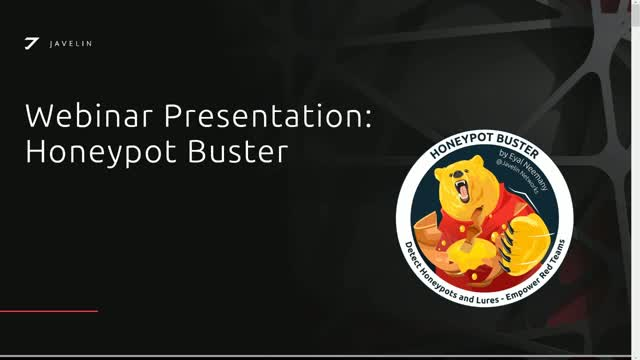 Eyal Neemany—security researcher at Javelin Networks—breaks down his most recent project: the Honeypot Buster. He walks you through the motivation of building the tool and its features. You will even see a live demo! Javelin AD|Protect focuses on the endpoint security issue of vulnerability by design. On the contrary, Microsoft ATA focuses on logs events and behavior. When it’s obvious that the attack starts on the endpoint, which solution is better suited to stop it? The FBI investigates thousands of cyber attacks at both the biggest corporate brand names to the smallest of non-profits. They see the same thing over and over - too much money spent on defense technologies that don’t stop attackers from penetrating the organization. Join us for an engaging session with FBI Cyber Squad Supervisor Scott Augenbaum to learn cyber attacker trends and pragmatic advice on how to mitigate threats. Scott Augenbaum, FBI Cyber Squad Supervisor, will provide the facts he’s experienced on his cases and engage in an active question and answer dialogue of what IT personnel need to expect and how to react to cyber threats. Joining Scott is Guy Franco. Guy is the CTO/Founder of Javelin Networks. A highly experienced Security Researcher & Developer, he performed as both Red Team attack and Blue Team defense in the cyber division of the Israeli Intelligence Corps. He has also worked commercially as a security consultant. Highly skilled in the field of Forensics and Security Analysis, Guy has cultivated a world-class repertoire of cyber defense tools and offensive techniques for network application. Attacker's Creed - Once Compromised, Watch What Happens. A military trained offensive hacker provides detail on the decision tree they must consider to move beyond the machine they compromised. Each decision incurs risk of detection, cost and time. Active Directory is an organization's greatest asset - and weakness. Attackers target this valuable database to access all users, credentials, computers, servers, applications, resources of the ENTIRE organization. Protecting it is required. Doing it from the endpoint before the attacker enters the network is essential. Your AD risk can be eliminated. Listen to an easy and efficient way to protect what no other security technology is doing or can do today. Javelin AD Protect was built by former 'Red Team' government trained attackers and will educate you on why Active Directory is easy for hackers to gain the 'keys to the kingdom.'. Once breached at the endpoint, what does an attacker do? Where is he going? What does he want? The truth of APTs and advanced attacks is that they just don't want one machine - they want access to the heart of the organization. Since 1999, Microsoft has made the Windows Domain the heart of the network. Once accessed, it permits the attacker to control the organization - undetected and indefinitely. This is what the attacker wants. This webinar will discuss all moves an attacker can make to go from a compromised machine to achieve his goal from a statistical point of view; we will present the probability of detection and evidence-gathering for any move made along the way. Roi is CEO and Founder of Javelin Networks, a post breach containment technology that focuses on stopping attackers from credential misuse and lateral movement after compromising a machine. Roi served in the Israeli Air Force at the OFEK unit where he worked on the security of the Israeli satellite launch, Arrow missiles and the Air Force drones. As a network and security engineer, he was influential in designing, developing, analyzing, implementing large enterprise communication networks, both nationally and around the world. Worked for four years as a Security consultant, leading ongoing projects at the Vatican and other military organizations.